I noticed that daytona's detection of the CPU/bus speed is totally broken ? Maybe this is effecting how timing works. This would he a hint that affects all Model 3 games? 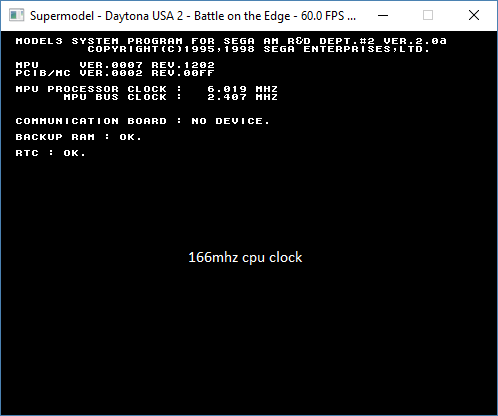 Ian wrote: I noticed that daytona's detection of the CPU/bus speed is totally broken ? Maybe this is effecting how timing works. I only noticed it because the guy made a video of daytona booting for spindizzi. There must be something off with our CPU emulation or something if the values are so way off. Maybe Bart will have some ideas about this. for the 68k, it is given a number of cycles to work for a lapse of time, but during this time, it does not necessarily use all these cycles that it has (no op). // Compute CPU clock speed assuming a 1:1 processor/bus clock multiplier. // Time base registers tick every 4 bus cycles. Pretty simple, right? We need something that counts the passage of real time: the real-time clock module. This is a CMOS device that returns a "wall clock time" and date in seconds. All you need to do is wait one second of real wall clock time and then count the number of ticks elapsed according to the PowerPC's time base register, which ticks every 4 *bus* cycles. I think on all Model 3 systems, the bus frequency is 66 MHz but the CPU is 66 (Step 1.0), 100 (Step 1.5), or 166 (Step 2.x) MHz. So the number of CPU clock cycles per time base tick differs. On Step 1.0, it's just 1 tick = 4 bus cycles = 4 CPU cycles. So what's going on with Daytona 2? Well, I don't know for sure, but let's think about it. We emulate the CMOS clock by returning the real wall clock time. So if you increase the frequency to 166 MHz and the frame rate dips below 60 FPS, the game will see that fewer than 166 million CPU cycles were executed in one actual second. So that's one potential problem. Nik also wrote code to further scale the time base ticks to the emulated frequency so that they always matched the correct frequency. 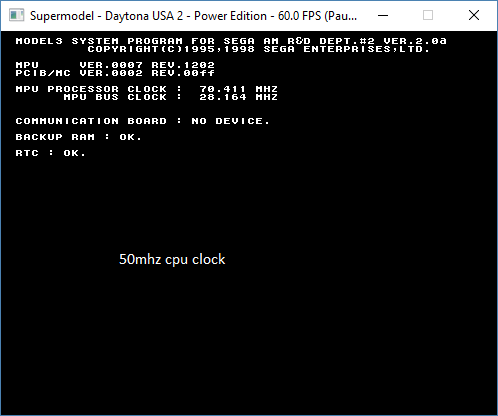 The emulator ticks the time base register such that after emulating N cycles (where N is the frequency we set in Supermodel, I think 50 MHz by default), the time base register should look as though the *true* number of cycles (e.g., 166 million for Daytona 2) has elapsed. It *should* be possible to get Supermodel to report the correct clock frequency even when running at a lower simulated frequency because of this multiplier. I vaguely recall Nik saying it didn't quite work for some reason but I don't know why. I think a better place to start would be my timing program. If anyone's interested, I could supply the ROM set and the necessary entry for Games.xml to get it up and running. Even without it, you could probably just print the difference in TBL after each second and see if makes sense from a timing perspective. You'll probably first want to undo the effect of that extra scaling value Nik multiplies by somewhere in the PowerPC core (set it to 1). I'll need to look into that at some point for frame timing because you guys are right -- it should just work. 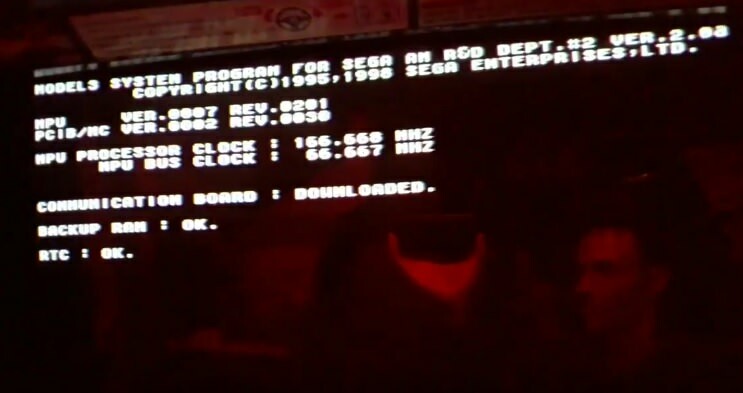 This is because Spindizzi emulated the network emulation and three games (Harley, Dirt Devils, and Ski Champ) worked without issues and when he tried Daytona 2 and Scud Race, it just keep resetting the networking process at boot. This isn't specially network related. General timing in the emulator is slightly broken. Maybe if we can fix this other things might fall into place. I did try this in mame and it was also broken. 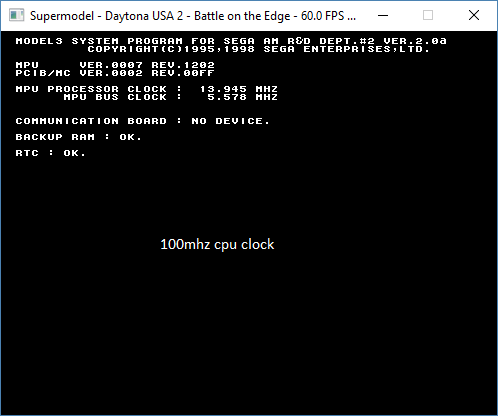 I think under mame Daytona reported the same bus speed as clock speed. Ian wrote: This isn't specially network related. General timing in the emulator is slightly broken. Maybe if we can fix this other things might fall into place. Daytona 2 must be doing something different to measure frequency. I wonder if its method for timing is somehow linked to overall frame timing? The CPU frequency *is* correctly derived from the bus frequency: CPU = (166/66) * bus. If someone could help identify *where* the timing code exists I could reverse engineer it probably without too much difficulty.